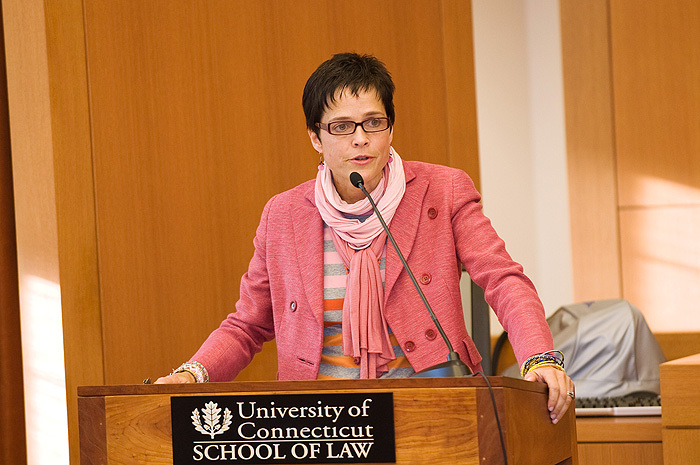 Speaker Explores Human Rights as Issue for the U.S. The Sackler lecture, held at the Law School, was the opening event for a conference on Human Rights in the USA, Oct. 22-24. Thomas is currently a research associate at the School of Oriental and African Studies at the University of London. She was previously a visiting fellow at the London School of Economics and was founding director for the Human Rights Watch Women’s Division. “We have a genuine problem, [and that is] articulating the relevance for human rights in the United States,” said Richard Wilson, director of the University of Connecticut Human Rights Institute, which sponsored the conference. Human rights, he said, have largely been seen as a U.S. export to third world countries and areas of conflict. Thomas’s comments focused on the importance of human rights as a national movement in the U.S. Drawing on her experiences with various international movements, she reflected on how her own thinking has developed. She said she now recognizes that it is wrong to view human rights in the U.S. as separate from human rights in other countries. Yet it is still an attitude that many Americans hold today when thinking about the applicability of human rights to national identity. Thomas now believes that incorporating the human rights movement into U.S. political activism can help reunite a progressive movement that has historically been fractured. She pointed to recent history when the progressive movement allowed itself to be misidentified by the right wing as a movement of non-patriots. “When progressives started to turn off on our country, they started to turn on each other,” Thomas said. She said that different progressive groups – the civil rights movement against racism, for example, and the women’s rights movement against sexism – downplayed their commonalities to better protect their own turf. Thomas said she sees the incorporation of human rights as a chance for progressives to create a unified front to combat racism, gender discrimination, classism, and other tenets that contradict the basic premise of human rights on a national level. Rather than confronting each separate issue that stands in the way of equal rights, she said, activating a movement for human rights in the U.S. would provide a single rallying point for citizens – a movement for human equality. After all, said Thomas, Americans are human, so human rights are as much of an issue for us as they are to the rest of the world. Thomas’s lecture was part of the Raymond and Beverly Sackler Distinguished Lecture Series, made possible by a generous endowment from the Sacklers. 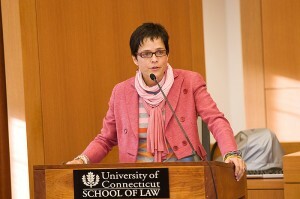 The series is designed to bring speakers from across the globe to the University of Connecticut to explore various human rights issues and trends. In addition to the Raymond and Beverly Sackler Distinguished Lecture Series, Dr. and Mrs. Sackler are active in various other philanthropic activities both at UConn and internationally, including the establishment of other lecture series, support for wings at both the Metropolitan Museum of Art and the British Museum, and the establishment of laboratories at academic institutions across the globe.